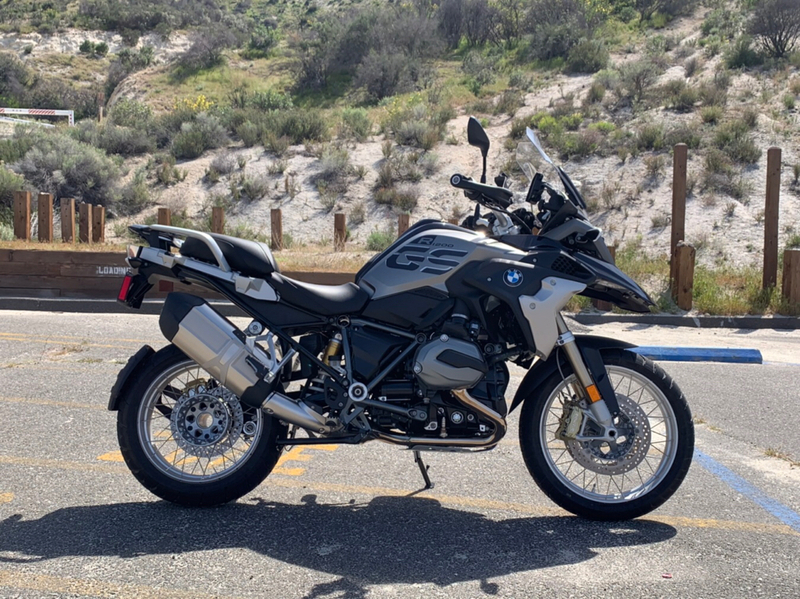 Just came back from picking my new baby up, a leftover 2018 R1200GS Exclusive in Espresso with the low suspension option. Had to take the train and get it from around 100 miles away but was totally worth it after riding her home. In fact, I just did over 160 miles coming back since i took the back roads that had me go over my local twisties. I made sure that I covered around 80-90 miles before I made it to the mountains so I was pretty confident that I scrubbed most of the rubber (at least on certain angles... lol). First impressions, 1 word... smooth.... although I shouldn’t be surprised as my other steed is a BMW R9T. Absolutely love the quickshifter although it will take me a while to get used to having it. Still a little notch going down the gears with it but I guess it will break in and smoothen out as the miles are put on. Suspension in dynamic mode is a little bouncy. Not sure if this is just because it’s new but again, we will find out given more miles. The TFT is just stunning to look at. I was able to easily pair my iphone and my UClear BT on my helmet and it worked quite well. Although music volume was a little on the low side but it might be my BT communicator. Splitting lanes with it was kinda scary since it felt wider than it actually is... I guess more seat time will get me more comfortable with it in traffic. Power wise, it was surprising at it felt livelier than my R9T. And I’m sure it’ll get better as the miles go. I am truly excited to put on some major miles in this bike as it’s starting to heat up here in SoCal. Ergonomics - was quite comfortable although I feel that the saddle is a little firm. All in all, it was an awesome day collecting my new steed. Cheers! ExHarley Rider, Rick92040, Ripcord and 1 others like this. Congrats and great bike. I love the low suspension on my 2015. I never have warmed to the quick-shifter though. Dr. Strangelove and asaulo1 like this. Congratulations for the arrival of your new baby. The shifting does get smoother, although upshifts in the lower gears unless wide open throttle are clunky. I use it to downshift frequently but only use if for upshifts if I'm hard on the throttle. I also have a 2018 Exclusive paired to a uClear Plus headset. Delete the uClear pairing to your iPhone. Pair your phone to the TFT and then the uClear headset to the TFT. Something gets quirky if the headset if paired to both. I also bought an end of year GS A. it was not lowered...thinking that Germans have 35 inch plus inseams, I’ve got 32 inch. Still it’s awesome and I’m finally getting used to the height... has the lowered model limited your off road options? I’m assuming it’s going to handle better off road with this standard seat height..any input would be appreciated. I'm sure it'll be somewhat limited when you try to tackle technical stuff but I'm going to use the GS primarily for touring with the occasional fire road. After having ridden the low suspension GS for a couple of hundred miles now, I'm glad I did get it as opposed to the standard height one. I feel more confident riding it and stopping at even inclined surfaces which I would think would be scary on the regular GS. Cheers! snip... has the lowered model limited your off road options? I’m assuming it’s going to handle better off road with this standard seat height..any input would be appreciated. That worry is often expressed, but (2016 lowered here) I have yet to read any report of a rider on a lowered complaining about its lack of height, or claiming that "If only I were on a standard height [xyz] wouldn't have happened." Of course inches are inches and a test terrain could be shown to affect a lowered though not a standard in a static test, but put a rider on the bike, and add speed and suspension adjustments, one rock sticking up, etc. and the variables are significant enough to make a true "dynamic" test very difficult to perform, much less assess in terms of lowered vs standard. In 44k miles on mine, admittedly by far mostly, but not all, asphalt, I have no scrape or dents on my bottom plate.There are probably plenty out there who view this bike as the ultimate road bike and off-road performance or capability is a nice, but a secondary feature. Fully agree.....key is to be comfortable on the bike......rest is secondary! A factory lowered non-ESA GS is the same height as an R1200R, a fine touring bike. My 2008 is lowered 22mm with Ohlins units and stiffer springs. It makes my friend's ESA bikes feel like Buicks, yet is never harsh. But I've been in several ruts and sand pits off road that left me stuck with both cylinders grounded, while my full-height friends rode on.